For the second outing of this brand new era, Chris Chibnall offers us a story about survival, a mystery and a pretty enjoyable character piece. In theory and on paper, these are qualities that are great to empasize this early into the series, but in practice, The Ghost Monument, like much of this series, feels very underbaked as it can't quite figure out where it is trying to go and what story it is trying to tell. The best episodes of modern Doctor Who always feel like a movie stretched across its 45 minute runtime. The Ghost Monument feels like the opening act to a grand movie in its 50 minute runtime. Even if the overall product is a little lacklustre, The Ghost Monument is a great example that the show still hasn't really missed the mark as it feels more like a proper Doctor Who story than The Woman Who Fell to Earth did. There are plenty of space-ship crashes, robotic foes, anti-gun monologues, ancient alien warnings and plenty of running. And director Mark Tonderai makes great use of the South African location to craft a convincing alien planet which is beautiful to look at, despite the weaker story elements. Immediately picking up where the previous story left off, The Doctor, Yaz, Ryan and Graham find themselves being rescued by two pilots who are in a competition, the reward for which is a large sum of money which would allow their families to never worry again. It works as a intriguing setup and promises some interesting character development for the guest characters around the quest elements of the story and gives it a sense of momentum. The guest characters, Epzo, played by Shaun Dooly and Angstrom, played by Susan Lynch give the Doctor two opposing world views for the Doctor to develop her character around. Epzo doesn't trust anyone but himself and Angstrom is a prickly survivor who isn't afraid to work with other people, despite her own trust issues. Of course it shouldn't come as a surprise the Doctor ends up on the good outlook of life, as do her companions, once they get used to being on an alien planet. In the long term, I expect the larger TARDIS team will allow the writers to tell more expansive storylines but it is evident here that the larger main cast only serves to give the writers more hurdles to jump over. 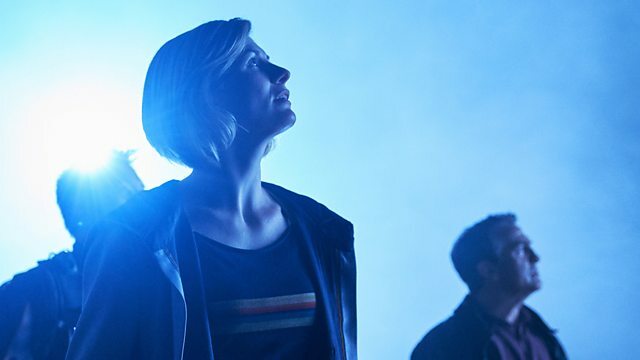 The Ghost Monument can't work out if it wants to focus on Epzo and Angstrom or the Doctor and her companions, so Chris Chibnall decides to not focus on any of them. While Ryan, Graham and Yaz remain enjoyable, I still don't know anymore about them than I did in the previous episode. And the Doctor is still coming into her own, an element of the plot the script mentions several annoying times. So far, she prefers to remain quieter, thanking her companions for not complaining she has accidently stranded them on an alien planet with no promise of getting them home safely. But she is far from being a pushover, calling Epzo and Angstrom out on their behaviour more than once and confidently dealing with the various threats the planet throws at them, including what looked like some murderous toliet-paper. The only Doctor moment that Jodie Whittaker gets this week is the moment when the main baddie, who isn't really the main baddie of a story that doesn't know what it is doing, teleports himself, Epzo and Angstrom away, leaving the Doctor and her companions stranded once more. It is clearly designed to be a moment where the companions rally around her, but it does serve as some sense of relief when the TARDIS finally appears right at the end. But the adoption of such a defeatist attitude feels so out of place in the character of the Doctor. Much of my problem with The Ghost Monument lies with the final act of the episode, which just can't find a satisfactory way of resolving the intriguing plot threads the first half of the episode set up. While I enjoyed seeing the Doctor and her friends running around on the planet Desolation, these sequences never really added up to much in the end. Epzo and Angstrom's budding friendship was never developed beyond some begruding respect, and the idea that the planet was once home to a species subjugated into developing weapons of mass destruction went absolutely nowhere. But perhaps the most interesting thing about The Ghost Monument is its tone, it didn't feel as whimsical as the Russell T. Davies or Stephen Moffatt era, but this episode still offers up some nice Doctor Who moments. For now though, it seems that Chibnall wants to make the show more grounded and serious.